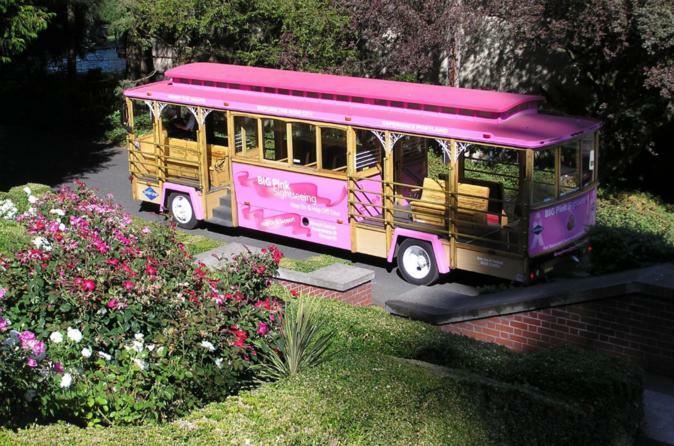 See all of Portland’s top attractions on this hop-on hop-off trolley tour, a fun, easy way to sightsee. With your 1-day or 2-day pass, explore Portland aboard a sightseeing trolley and hop off at any of the 13 stops to visit Pioneer Square, Washington Park, the Oregon Zoo, the Pearl District and more. Enjoy the fresh air with the open-top seating or opt for the indoor seating section. Your expert guide will offer commentary about the history and culture of Portland throughout your ride. Portland is a city of contrasts -- a lively city center surrounded by natural beauty, from Washington Park and the West Hills to the Willamette River and Waterfront Park. With your choice of a 1-day or 2-day Portland sightseeing pass, hop aboard the open-top trolley in Pioneer Square and travel with ease around the city, your expert onboard guide providing commentary about Portland’s history, culture and main points of interest along the way. From your spot in the open-air or indoor seating section, sit back, relax and take in the sights on the whole 1.5-hour route or hop off at any of the 14 stops around the city to explore at your own pace. Visit the world-famous International Rose Test Garden and spend time in South Park Blocks, the heart of Portland’s culture district featuring the Portland Center for the Performing Arts, the Oregon Historical Society and the Portland Art Museum. Wander through the Portland Japanese Garden of Washington Park, see animals at the Oregon Zoo, visit Portland’s Children’s Museum, and browse boutique shops in the NW 23rd Ave shopping district. In the fun and fashionable Pearl District, stop by Powell’s Books, the world’s largest independent new and used bookstore, and find your chi in the Lan Su Chinese Garden. Other highlights include Lownsdale Square, the Oregon Museum of Science and Industry (OMSI), Old Town and Riverplace. A portion of your all ticket sales goes to breast cancer awareness and research, so you can feel good about your hop-on hop-off pass purchase.